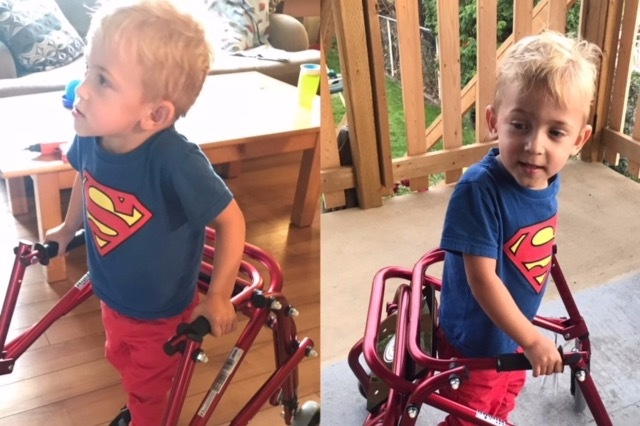 3 year old Ben Weller was diagnosed with Spastic Diplegia Cerebral Palsy at 6 months old and has not walked independently -yet! Ben is in the 3% of Cerebral Palsy patients accepted to receive an operation that will change his life. Dr. Park, of St. Louis Children's Hospital, has helped hundreds of children with cerebral palsy. He invented a life changing procedure called Selective Dorsal Rhizotomy (SDR) which pin points the damaged nerves by opening patient's spinal cord. Using electricity, he finds and cuts the nerves that once connected the damaged part of the brain to the spastic muscles, eliminating them completely. 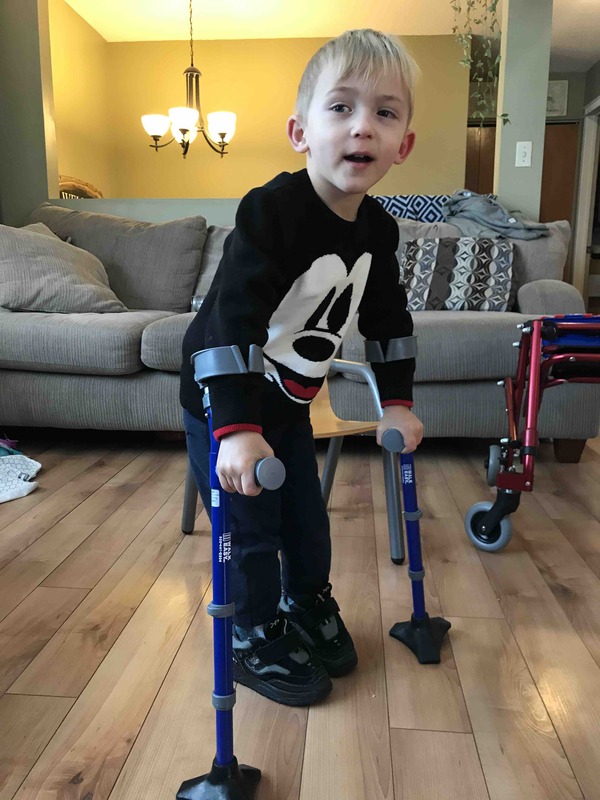 With your help we strive for 1000 people to donate $100 each as an effort to fulfill Ben's Wish to Walk and the Weller's Dream to see 3 year old Ben walk and play with his twin brother Alex. Here is Ben's story as told my his mother Stephanie. Dallas and Stephanie live in West Kelowna, BC Canada. At 6 months old, our world was turned upside down. Myself and my husband received the news that, most likely, our son had cerebral palsy. I'll never forget that moment. We were both frozen with fear. Paralyzed with the unknown of Ben's future, feeling like all the dreams we had for his were frozen. On November 26th, 2018, his future gets a second chance. We are so fortunate that Ben has been accepted to St.Louis Childrens Hospital for selective dorsal rhizotomy, SDR. 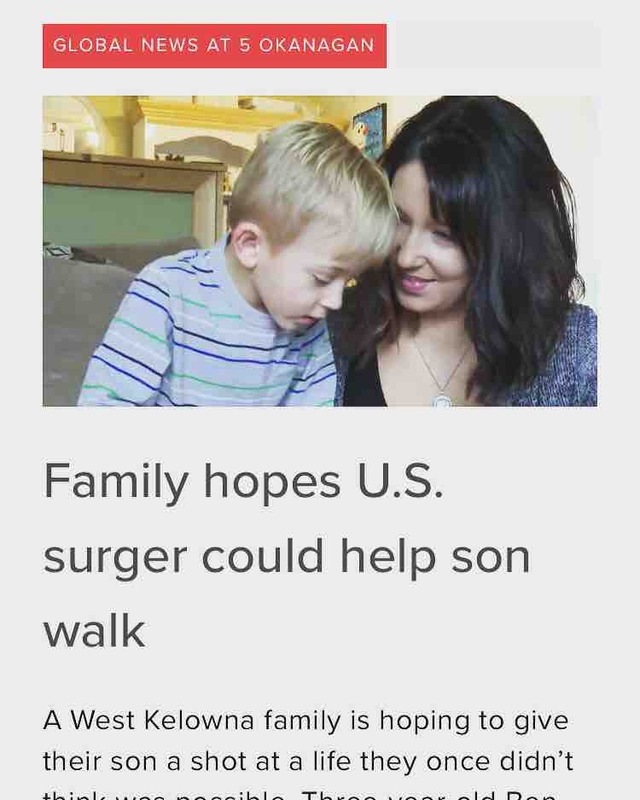 Ben's wish to walk will come true. My son Benjamin Weller and his twin brother Alexander were born 11-weeks early. Roughly three months before their due date, my husband Dallas and I were told that one of the babies wasn’t growing as quickly as the other. Kelowna to BC Women’s Hospital in Vancouver. On December 14, 2015, an emergency c-section brought Alex and Ben into the world, 11 weeks early. Alex weighed 2 pounds, Ben, 2.5pounds. They were too little to bottle feed or breast feed yet, so they spent two months in the Neonatal Intensive Care Unit on oxygen and feeding tubes while we worried at the Ronald McDonald house. After 75 days in different hospitals, we finally brought them home. Then we started to notice Ben’s muscles were developing differently. We noticed Ben was always easier to startle, and he was always fully extended, legs straight and sometimes crossed feet, like scissors. But we were so thankful we had two wonderful, happy babies. Our world changed on their six-month checkup. Ben had three major red flags signalling a traumatic birth brain injury known as cerebral palsy. He had a head ultrasound done and it showed damage to the front part of his brain. We were devastated. I remember thinking how can this happen to such a little child. He didn’t even get a chance to feel what running would be like, or to chase his brother around. We had been through so much and just when we thought it was all getting into some normalcy, our world was turned upside down. He will feel extreme pain in his legs and muscles as he gets older and even now has horrible pain with growth spurts. Cerebral palsy is not curable and usually gets worse with age but there is hope! Dr. Park in St. Louis offers a surgery that has helped hundreds of children with cerebral palsy. He invented a life changing surgery that uses electricity to pin point the nerves that are damaged to the brain by opening a patient’s spinal cord, finding and cuts the nerves that connect the damaged part of the brain to the spastic muscles, eliminating them completely. Patients and children from all over the world try to get him to approve this surgery for their children. Now that Ben is approved for SDR at St. Louis Children’s, we will be flying out and spending four weeks in St. Louis, seven days in the hospital and three weeks of inpatient therapy before coming back to Kelowna for intensive rehab for a year. Dr. Park has reviewed Ben’s file and xrays and is very excited for the outcome after SDR. We are scheduled for some time in early 2020 but also on a cancelation list in which we will get contacted 2-3 months prior to surgery date. Please donate to help Ben's family afford all of the expenses from this out of country opportunity and chance of a lifetime. We haven’t done an update in awhile. Ben has been working hard on his balance and walking with his forearm crutches. The stronger his core muscles get, the easier recovery is going to be!! 2019 is going to be the best year YET!! Thank you all so much! We have had such encouraging and wonderful messages from everyone. And especially coming into Christmas it’s been so generous of everyone. Thank you!!! We did an interview today with Global Okanagan! 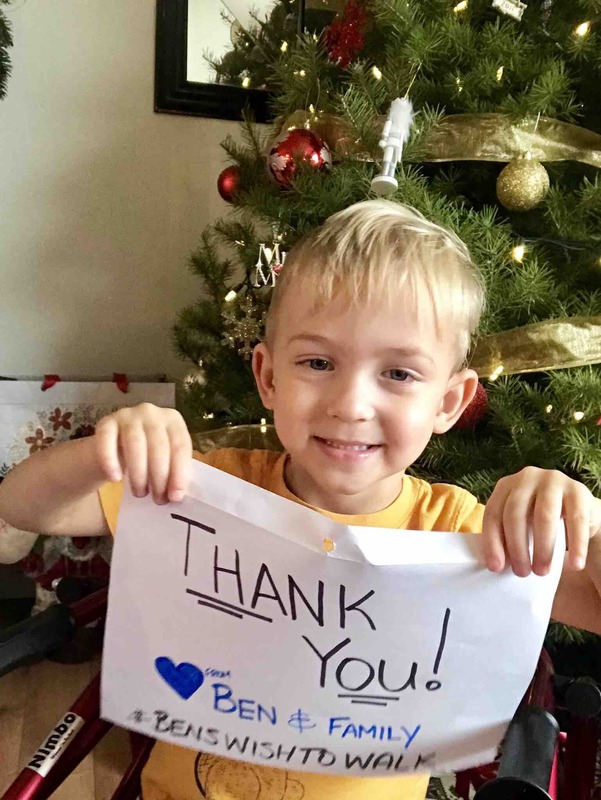 Thank you everyone for making Ben’s wish to walk a reality!! We are so fortunate to have such wonderful friends and family and an amazing community helping to get this amazing little boy walking.